A PMP and Six Sigma professional with more than 15 years of technology education experience, and editor-in-chief of GilsMethod.com. Windows Live Mail has been discontinued by Microsoft. However, some people may still use it, so these instructions are preserved to help them add additional email accounts. This guide will show you how to add additional email accounts to Windows Live Mail so that you can access all of your emails in one place. As with most applications, there are some limitations to the types of servers and email providers that are supported. Windows Live Mail can support most webmail providers including Outlook.com, Gmail, and Yahoo! Mail. 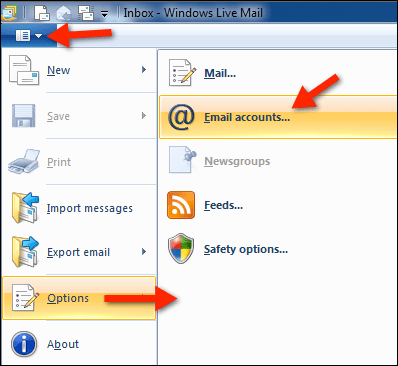 In the following steps, we will show you how to add email accounts to Windows Live Mail. Click the blue Windows Live Mail button located on the top-left corner of the application window. When the Accounts dialog box appears, click the Add… button. Select Email Account as the type of account you wish to add to Windows Live Mail. Enter your email account and login credentials along with the option to set your Display name. Make sure Remember this password is checked if the computer is not shared. If you have multiple users on the same account you can uncheck this option or create multiple Windows user accounts and not have to worry about your privacy. If you have more than one account and would like to make the account you are adding the default account, check the Make this my default email account checkbox. If you are using an email provider that is not automatically configured with Windows Live Mail, or if you host your own email server, you may need to manually configure the email server settings. To do this, check Manually configure server settings and click Next. Add the information needed to connect to the email servers. Once you enter those settings, Windows Live should be able to fetch the emails without a problem. When you have added the account and saved the settings you will be able to access all of your email accounts in one place. You will notice that Windows Live Mail will have a section for each email account added. Enjoy the comfort of reading all of your emails in one place. What Does Microsoft Live Photo Gallery Offer?